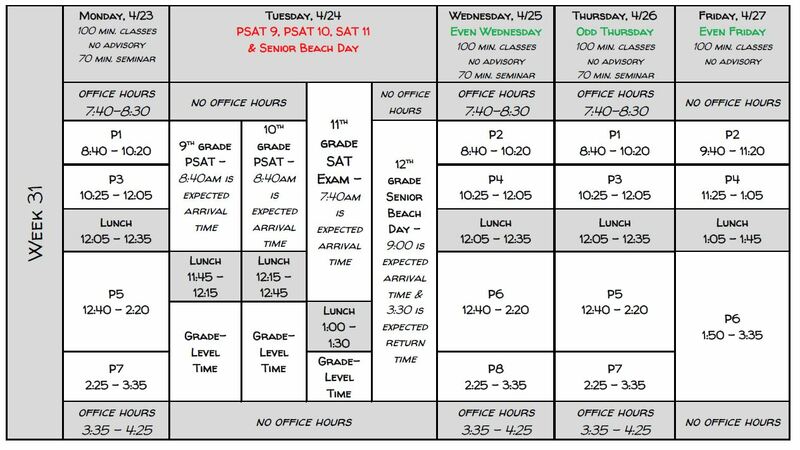 This week’s schedule is very different than usual because of PSAT and SAT testing on Tuesday – please see below. Odd periods will meet on Monday and Thursday, and even periods will meet on Wednesday and Friday. 11th graders need to arrive at school by 7:40am on Tuesday. Tomorrow, Friday 4/20, is both the anniversary of the 1999 Columbine High School shooting, and also a day when many young people make poor decisions regarding marijuana use. For both these reasons, I ask that you have a conversation this evening with your children both about their feelings of safety at school, and to be aware of the specific details of where they will be and who they will be with both before and after school tomorrow. We encourage all students to “see something, say something” to a DVS staff member if they are aware of something happening that could be harmful to our student safety and/or school community. Please feel free to contact me at swallis@davincischools.org with and questions or concerns. Our third School Site Council meeting will be this Thursday afternoon, from 4:00-5:30. All DVS parents and students are invited to attend! Here’s the schedule for next week! All DVS parents are invited to our School Site Council meeting on Thursday at 4pm! 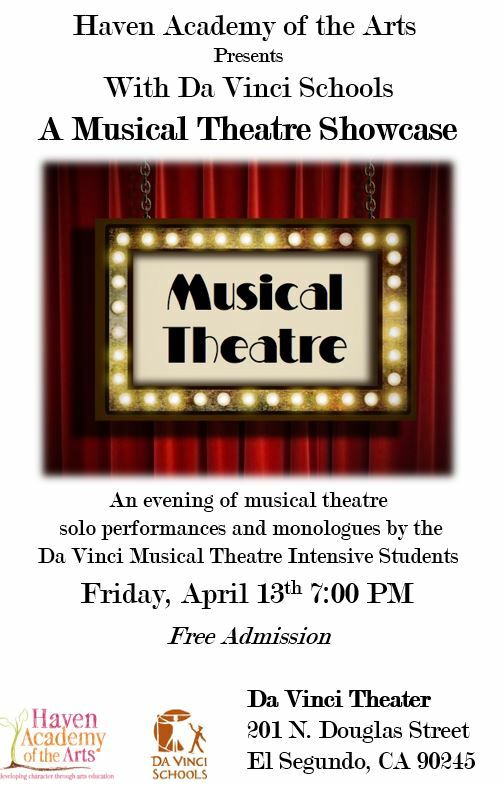 This Friday is our first-ever DV Musical Theater Show! We hope you can make it out to watch our students perform! 11th grade College Planning meetings start on Tuesday, April 17th and will run until Wednesday, May 2nd. 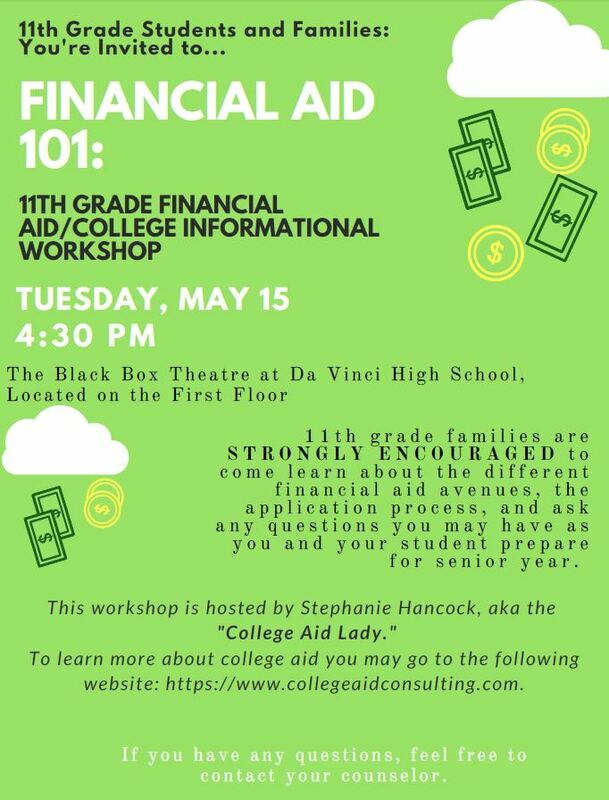 We hope to have the parents of all of our 11th grade students sign up and attend!